When to use a Gantt Chart for a project and when not to? The Gantt Chart, a type of bar chart, is a specific method to make the project comprehensible in a graphic way. The question, however, is: when does it make sense to use a Gantt Chart and when doesn’t it? 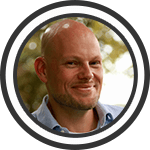 When speaking to organizations, I have noticed that they are not always sure about this and therefore waste time or lack certain insights. In this blog, we will provide concrete guidance on the truth and myth of using the Gantt Chart. Before we continue, it is a good idea to make a distinction between project planning and resource planning. For project planning, the focus is on the project or the projects. You look at the plan from the perspective of the project and the way the project is sub-divided into phases, activities, sprints, etc. The project plan is intended to define and manage the individual components of the project and their dependencies. The measuring unit used is duration. For resource planning, the focus is different. It is about the capacity plan. We look at the project from the perspective of the resources. This does not need to be limited to only employees, but can also include vehicles, spaces and third parties. The emphasis is on staffing and the measuring unit used is man-hours. You want to know what the availability of the resources is. It is determined not only by the use on projects, but also by labor contracts, leave, bank holidays, etc. 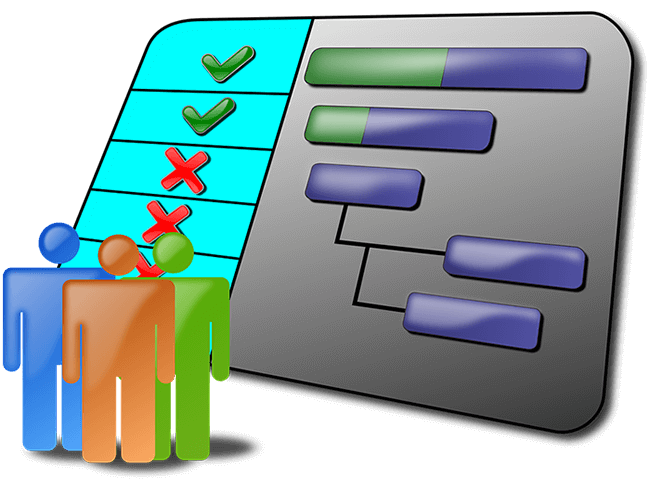 The Gantt Chart is suitable only for planning the duration, so it is only useful for project planning. We are therefore looking purely at the added value of the Gantt Chart for project planning. Henry Laurence Gantt developed the Gantt Chart around 1910. He worked as an engineer and a consultant and he used it as a visual tool to show the schedule and progress of a project. This was seen as a revolutionary new method at the time and it became very popular for large construction projects. A Gantt Chart consists of a number of rows, which each show a phase or activity within the project. The first phases/activities are usually at the top and the time is shown on the x-axis. A bar shows how much duration is needed for each activity. Individual dependencies can also be shown, so that, for example, it is clear that activity B can only be started after activity A is completed. You can also visually show milestones that show an important moment, such as delivery time or when an important decision must be made. The great thing about the Gantt Chart is that it forces you to take the project apart and divide it into components and that is very helpful when you are dealing with a big project. It also helps to see things in perspective to each other, which is helpful for determining a more realistic duration. A great advantage of the Gantt Chart is that it helps you visualize a complex issue. People often think in images, so it helps to better understand a complex issue. This makes it easier to explain to team members and other stakeholders what is happening in the project and what is expected from them and when. Please note: a Gantt Chart can help, but it is not a guarantee. If you start intricately with all the options, for example, in terms of dependencies, such as start-to-start and finish-to-finish, you can make it very complex again. That may be necessary if you want to build a rocket, but in general that is not the method we want to use as a service provider. 100% accuracy in all details is not the goal, as far as I’m concerned. Planning is not an exact science and that’s why I primarily see the Gantt Chart as a tool for communicating. One tip is therefore to keep it simple. Another tip is to limit the scope. If you include a ton of details, it will be a very large Gantt Chart. That brings with it the risk of it becoming a paper tiger. If you want it to have any meaning, you will have to keep updating the Gantt Chart to include all the latest developments. This is not a defect of the Gantt Chart, but a small point of criticism for the project manager. 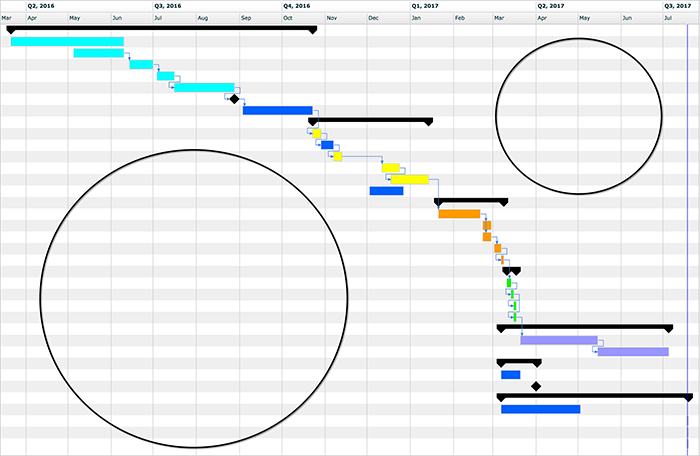 We often see that a Gantt Chart is created at the start of a project and then never updated. It is a communication tool, so working with a Gantt Chart creates the obligation to regularly update it. In addition, there is another practical point you will run into with a big Gantt Chart: it no longer fits on one A4 and becomes hard to read. It is also inconvenient to print the plan on multiple pages and then cut and paste them together to hang them up on the wall. Very impractical if the plan is often adjusted and, therefore, it is no wonder that the project manager often ends up not updating it. Maybe the solution is very simple: no more printing. Printing is kind of outdated now anyways. Just look at it on your computer screen. But even then, you will still need to see it in one overview. The only disadvantage that then remains is that a Gantt Chart will proportionally have many white areas. Most of the activities will often run from top left to bottom right and there is no option to compress the Gantt Chart or make it fit the screen and have it still be legible. We had already stated that the Gantt Chart is not suitable for resource planning, but we will explain this further here. The Gantt Chart only shows the duration per bar. This duration does not provide any information about the required capacity to complete the activity. A bar with a short duration of a week may require 500 man-hours, while a bar with a duration of 4 weeks may only require 16 man-hours. This is one of the limitations of the Gantt Chart. When you work with projects that are resource-driven, there is a dependency between duration and man-hours. Deadlines can affect the demand for capacity and available capacity can affect the deadlines. The Gantt Chart cannot take these dependencies into account, so that makes it difficult to assess the feasibility of your schedule. If, for example, a client asks for a visual image of the schedule, you will want to provide this. Even if it is a relatively simple project, the customer is king and if he wants it he can have it. Or a primary contractor wants a graphic image of your schedule. For example, because he needs to see your schedule in the context of a greater whole. For technical service providers, it is sometimes part of the contract to regularly provide an updated Gantt Chart. In that case, you don’t have much choice. You just do it. In addition to activities that your organization carries out, you may also have to deal with external activities that you depend on in your project. For example, the delivery time of a part you need in an assembly activity. You can’t start this activity until the part has been delivered. Another example is an activity by the client, where the client needs to evaluate a design. This is also a scenario where you are dependent. You can only carry on after the client has provided feedback. A Gantt Chart offers a good solution in these situations, because you can clearly show these external dependencies on it. This helps in better coordinating these activities and bringing them in line with the supplier and clients. In this case, the Gantt Chart shows much more than just the activities you have to carry out yourself. Milestones are also a good example of this. They are points in time when a important delivery or decision occurs. You generally do not plan capacity for milestones; they are purely for visual support. If your project includes a lot of activities, even though you have tried to keep it as simple as possible, a Gantt Chart can be a solution. As mentioned earlier, it forces you to organize your thoughts. Plus, communicating entire lists of activities with your team members is not very friendly. By visualizing it, it is easier for everyone to absorb it. This makes the Gantt Chart a powerful communication tool. Now the question is: what is a lot? That can differ per branch, of course. If there are more than 20 activities, I would consider visualizing it. Especially if there are dependencies as well. You don’t even have to share the Gantt Chart with others. Even if you just make one for yourself as project manager, it will give you a bit of extra support. Gantt Charts do not have added value for every project. A Gantt Chart for a project that will run for 3 weeks and has 5 activities will not add much. Everyone involved will know what they are doing and what the next step is. The client simply expects the result in 3 weeks and doesn’t need to see a schedule. On the other hand, if you have a project with a lot of (external) activities and mutual dependencies, it is convenient to have a visual image of this. Creating a Gantt Chart does offer added value in that case, particularly as a communication tool. The conclusion is that you need to consider for each project whether it makes sense to use a Gantt Chart. Don’t waste time creating great graphics that are going to be useless to you and the people you are working with or for. There are better ways to spend your time, right?